I'm just a regular guy who likes old stuff - mostly old cars, old buildings, old highways and old bridges. I'm not a professional historian nor an engineer, I'm just a guy who likes history and wants to help document all these wonderful old structures before they're gone. 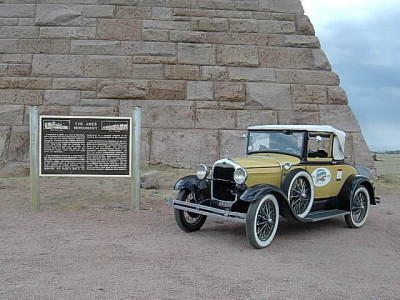 Old cars: In 2003, I drove my 1929 Model A Ford, "Sonja," to Manhattan where I met up with 53 other nuts in 26 other cars. We drove the Lincoln Highway to San Francisco. Sonja was the oldest car in the parade, and if you visit the Bridge Hunter site, you'll notice that some photos of Lincoln Highway Bridges were taken through Sonja's windshield. Sonja shows up in a few pics around here, too. Yup, we were there, too. The Ames Monument in Wyoming. Old Highways: Well, as you've probably noticed, I'm a fan of the Lincoln Highway and I posted several LH bridges on the Bridge Hunter site. I'm intrigued by many of the named highways of the United States and what America's highways were like before 1926 when they became numbered roads. Just yesterday, I found myself on the Herbert Hoover Highway in Iowa. I often find myself on the Wisconsin segment of The Yellowstone Trail. Old Bridges and Landmarks: I'm particularly fond of trusses, arches and movable crossings, including movable bridges and ferries. We seem to have a great number of movable bridges in Wisconsin and it's been fun to hunt them down. There's nothing like the thrill of finding an interesting bridge or landmark, especially when you're not even looking. (I found the two bridges in Waushara County by accident - I was on my way to somewhere else and just came across them.) I came across a beautiful Queen Anne in Dubuque recently that isn't on the NRHP but is a local landmark and will add it to our little database. Works of Art: Sometimes, a landmark is itself a work of art, or it contains, works of art. In Wisconsin, we have several sites created by amateur artisans, sometimes called, self taught artisans. 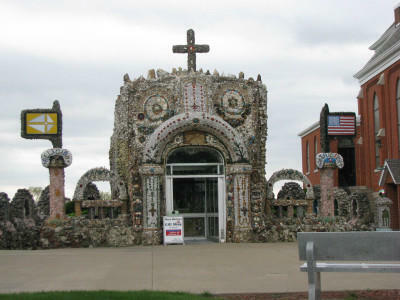 Probably most famous are the The Grotto and Fred Smith's Wisconsin Concrete Park, both listed on the NRHP. 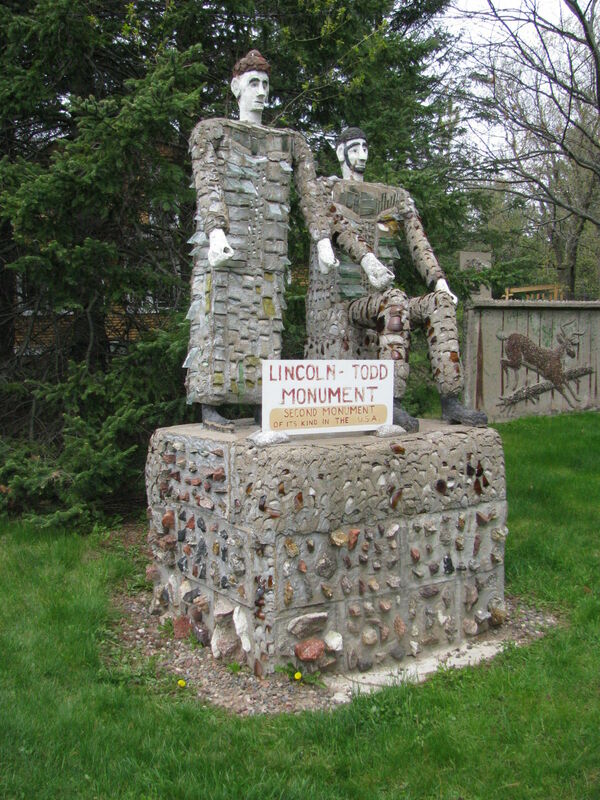 Lincoln Todd Monument, Wisconsin Concrete Park. Professional artisans have made their mark on the landscape, too. 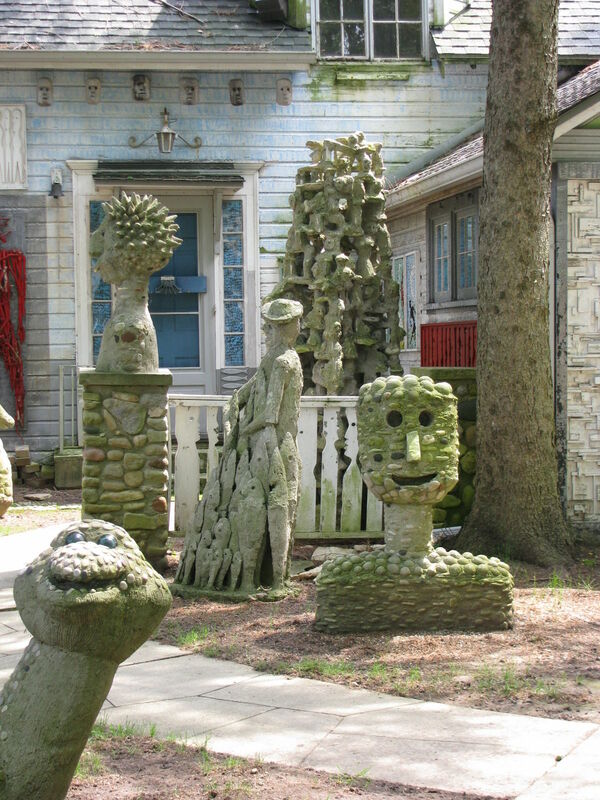 In the Milwaukee area, Mary Nohl decorated her home with statues and whimsical figures, so much so that her home became known as "The Witch's House" and was the subject of several ridiculous urban myths. After her death, her estate is the subject of much controversy. The Mary Nohl Art Environment, her estate, is listed as one of the most endangered landmarks in Wisconsin. Mary Nohl Art Environment, Fox Point, Wisconsin. Music City, USA (Nashville, Tennessee) is famous for many NRHP listings, including the only full-scale replica of The Parthenon in the world. 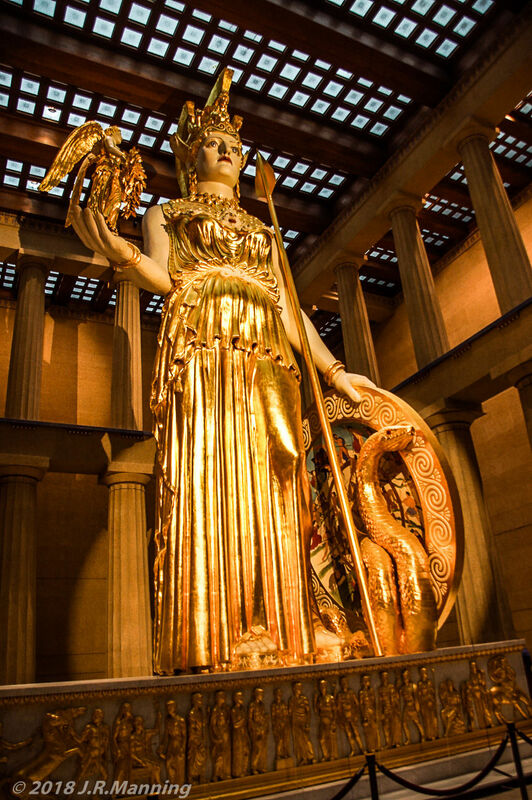 The Parthenon, in Centennial Park, is also home to Athena Parthenos, a modern replica of a statue that was part of The Parthenon in ancient Greece. The statue, by Nashville artist Alan Lequire, was created from descriptions of the ancient original. Athena Parthnos, The Parthenon, Nashville. Several years ago, I had the good fortune to have a job that sent me all over the midwest. I took several thousand photographs for my employer, and when I had time off, what did I do? Shot photos of bridges and landmarks. I've often told my friends that I'm one of the few people who can say that I've visited every county in Wisconsin, all 72 of them. Other than politicians looking for state-wide election, it's not something most people aspire to and I'm not even sure why I established that as a goal. Just the same, if you look at every county on the Wisconsin map, you will find photos that bear my copyright of several landmarks in each Wisconsin county. As much as I love traveling, my home state of Wisconsin is a beautiful place, I've always enjoyed living here. The politics drive me nuts sometimes, but I suppose that is true wherever you go. When you put that aside and look around, you realize that each county has something interesting to offer. From the rolling cornfields of Polk County, to the breath taking Apostle Islands in Bayfield and Ashland Counties, the lakes of Oneida County, the orchards of Door County, the unbelievable Driftless Area of the southwest, the Kettle Moraine of the east and the combination of natural and man-made landscapes in Milwaukee, there's something of interest everywhere. Began operation in 1892 as Alabama's largest cotton mill, manufacturing sheeting. Now that you mention it, baseball would be a lot less interesting without mounds 60'6" away from home. I didn't want to be the start of a third mound. Andrew, do you know much about the Mothman Prophecies and the collapse of the Silver Bridge? Perhaps you could enlighten us. Great find, Andrew. I think this site should be added to the Effigy Mounds category as it seems to meet the qualifications for inclusion. Great find, Andrew. I wonder if this site should be added to the Effigy Mounds category? Looks like it could use a coat of paint. I'd suggest Aura® in Ghostly Gray with Spectre Spruce trim. According to the wcfCourier, the $6.5 million referendum to build a new courthouse went down to defeat by a 3-2 margin. According to the same newspaper, supervisors said they would pursue building a new courthouse, anyway. This is the third oldest continually operating courthouse in Iowa. According to Supervisor Joel Voaklander, in the same wcfCourier report, because of the referendum result the county board will now study the possibilities of rehabilitating the old courthouse. That's okay, Wes, most of us here are off just a little, probably half a bubble. I love finding places like this! I always wonder about story songs, whether the song's story has any basis in fact (like this one) or if it's just pure fiction. Actually, this one started out as fiction, the church was built after the song was written. Sometimes, life imitates art. By the way, the Carter Family recorded the song in 1932. There's a copy of it on YouTube that inculdes an old photo of the church, well before the highway was widened. The confusion arose because both houses have the same address number. The Surgeon General was right - tobacco is bad for your health. Well, to be perfectly honest, when I shot the building, I saw the ghost but I was so intent on finding the landmark that it didn't register with me. Two days later, when I returned to Dubuque, that sign jumped off the side of the building, climbed into the front seat of my car and slapped me, saying, "HOW COULD YOU MISS ME???" So I went around the block and shot it! Oh, Guru of the Mail Pouch Barn…did you happen to notice the ghost of Bull Durham on the south face of this landmark? I hereby place this entry into nomination for the award in the category of Best Name of a Landmark. Yes, but I don't want to give this site a PG-13 rating. Velveeta is to cheese what Ed Wood was to Orson Wells. Velveeta is to cheese what MD 20/20 is to Dom Pérignon. Velveeta is to cheese what the Yugo is to Maybach.